People have a tendency to move around the world. When they do this, more often than not, they’ll take the flavours of home along with them. It might be an envelope of seeds saved from the plants they cooked with back home to plant in a new garden in a new country. Or culinary traditions and family recipes that will provide a sense of familiarity thousands of miles from their place of origin. One of these culinary immigrants is the bialy. Bialys are a bit like bagels in that they have a chewy crust and soft, airy interior. But in place of the hole, a bialy has a spoonful of oniony filling. Now I need to be honest here and tell you that I’ve never tasted a truly authentic bialy. The full extent of my bialy experience is based on reading about them in books and on blogs, watching YouTube videos, and trying recipes in my own kitchen. So what follows is my interpretation of the bialy. I’m always drawn to foods that have a story behind them, and bialys bring with them a tale that crosses continents. The bialy story begins back in Bialystok, Poland. It’s the early 1900’s, and Eastern European Jews are heading for America, following the promise of a better life, free from prejudice. As the immigrants arrive on the shores of the USA, they bring with them not just their culture and religion, but their recipes too. And as Jewish neighbourhoods develop, the bakers from Russia and Poland find a role in feeding their fellow immigrants with foods they are familiar with. Bagels, blintzes and borscht made their way across the Atlantic Ocean, and became a part of the American culinary landscape. With them came the bialy, and to this day it is a popular feature in New York bakeries. Over the last few months, I’ve tried a few different bialy recipes. They’ve all turned out pretty good, but the one below works best for my baking style and oven. It’s pretty much lifted from this YouTube video – I halved the amounts because, even as a family of four, we were never going to eat 16 bialys before they became stale. And I cut down just slightly on the amount of yeast to try to get a rise that takes just a little longer. Oh, and the filling uses a non-standard red onion and a little thyme. I’m not sure how much meddling with filling ingredients is acceptable in the world of bialy baking… it’s tempting to try a mix of seasonal herbs, maybe some garlic, or cheese even. Have you tried a genuine, New York bialy? Mix the sponge ingredients until completely combined, cover and leave overnight at room temperature… or for up to 24 hours if your room temperature is on the cold side. The following morning, add the rest of the dough ingredients to the sponge and mix thoroughly – I don’t have a stand mixer, so I use my hands to do this. Turn the dough out onto a clean work surface, and knead* gently for 2-3 minutes. Bring the dough together to form a ball, cover it with an upturned bowl and leave to rest for a few minutes (2 or 3 is fine). Knead the dough again for 3 minutes, rest, then knead a final time. The resting really helps to make the kneading easier – you should feel the difference each time you come to knead the dough again. After the final knead, form the dough into a ball and place it in a large bowl. Cover the top of the bowl with cling wrap or a damp tea towel and leave at room temperature for about 2½ hours. The dough should pretty much double in size, but how long it takes to do this will depend on how warm it is. Once the dough has risen, gently tip it from the bowl onto a work surface and divide it into eight pieces (each one should weight about 100g). Form each piece of dough into a ball and place them on a floured baking tray or board. Sprinkle some flour over the top of the dough balls, cover and leave to rest for an hour. 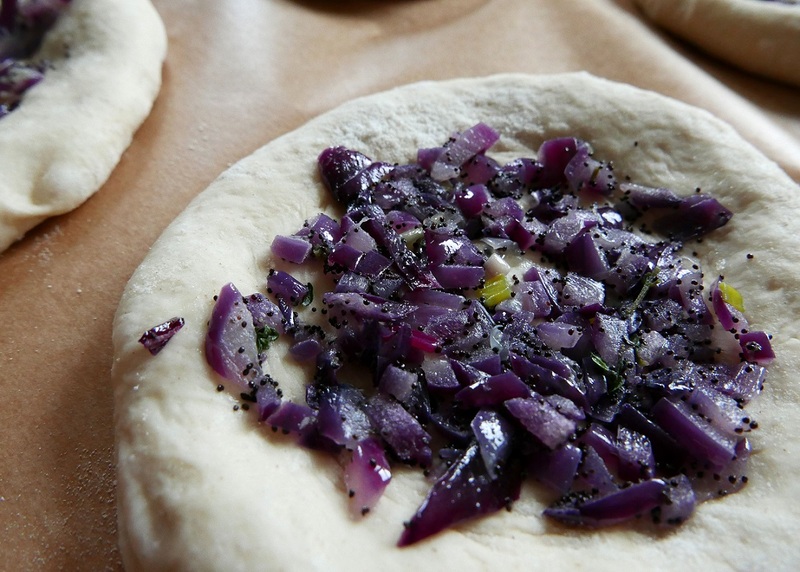 While the dough is resting, you can prepare the onion filling. Heat the oil in a large frying pan over a medium heat. 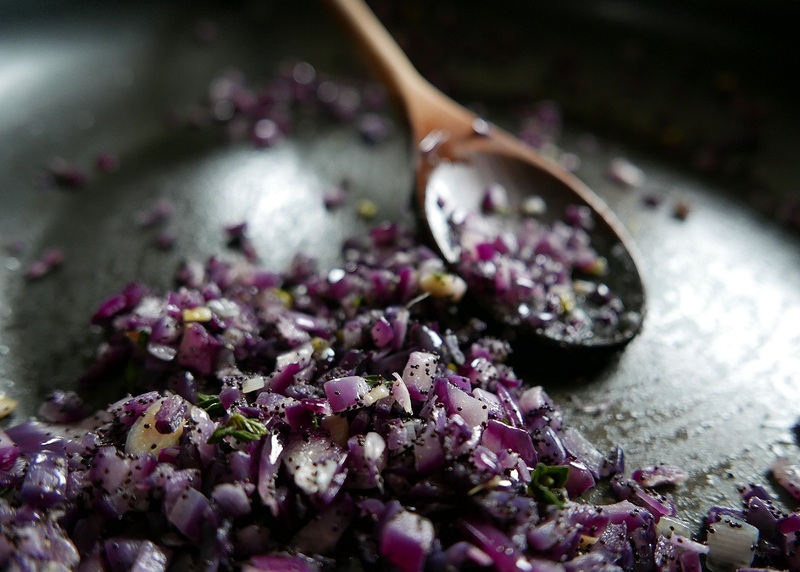 Add the onion and thyme leaves and sauté gently, stirring from time to time, until the onion is softened. Remove from the heat, season the onion to taste with salt and pepper, and stir in the poppy seeds. Place a baking sheet on the middle shelf of the oven and get it heating to 200oC/400F/gas 6. Shape each dough ball by using your finger tips to push out a circle with depression in the centre and a slight ridge all around the outside. The circle should end up about the size of a small saucer. Place each circle of dough onto a sheet of baking parchment cut to the size of the baking sheet you have heating in the oven… unless you have a huge baking sheet, you’ll need to bake the bialys in two batches. When the first batch is shaped, spread a good heaped tablespoon of onion mixture over the central depression in each dough circle. Transfer the baking parchment directly onto the hot baking sheet and bake the bialys for 10-15 minutes – until the dough is a light, golden brown. Repeat the shaping, filling and baking for the second batch of dough balls. Allow the bialys to cool slightly before enjoying them freshly baked, or cool completely – they can easily be re-warmed by putting them in the oven for a few minutes. They’re great as a snack on their own, and fabulous with salads and soups. 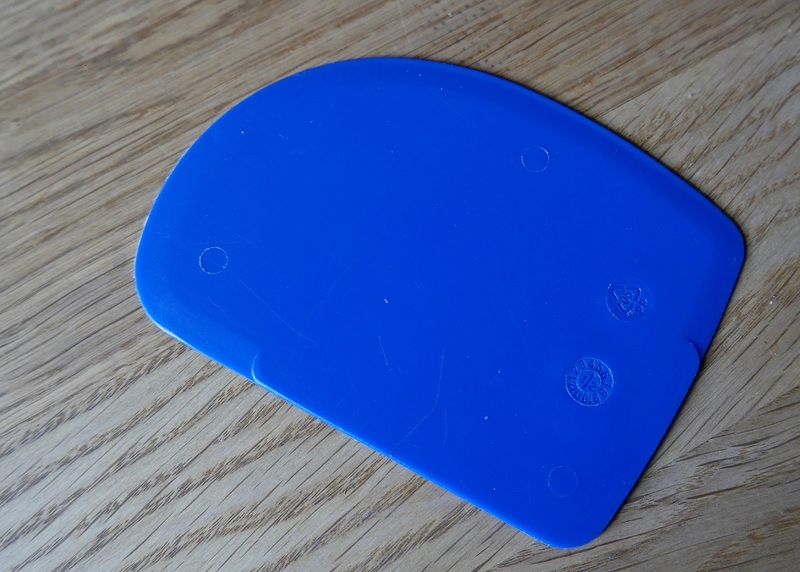 It doesn’t look like much, but it’s the best kitchen gadget I’ve ever bought. They’re really cheap to buy and make working with dough so much easier. Great story! Never had a bialy, but will soon remedy that. Thanks for the recipe. These are new to me, but they look delicious. Interesting stuff, I’d never heard of these before. I’ve never come across bialys before but they look and sound very tempting. It’s great that you’ve been able to share their history too. Love this! As someone who grew up eating bialy s, and actually went to Bialystok and ne’er found a bialy there, I’d venture a few comments. The taste of the dough is very soft wheat, even though there’s a kind of tear to the tooth quality that you might get on a good crust on a good bread. And the crust is floury. Also, I’ve never seen red onions, only brown ones, and they are very caramelised and salty and sweet at the same time, and actually fairly scant on top of the bialy. BTW people compare Bialies to bagels because they are Jewish things and often sold at the same bakeries but they really are different. Oh how I wish I could have one now! I hadn’t heard of bialy before but I would like to try one from your description. Interesting background to them as well. I want one (or two or three) now! Australian cuisine is the story of immigrants, so much of what we eat has evolved from wave of Asian and European and middle eastern migrants. it has enriched our pantries and menus for the better! What a coincidence I was reading about these this morning in a gluten free bread book and I had not heard of them before. I must give your version a try. 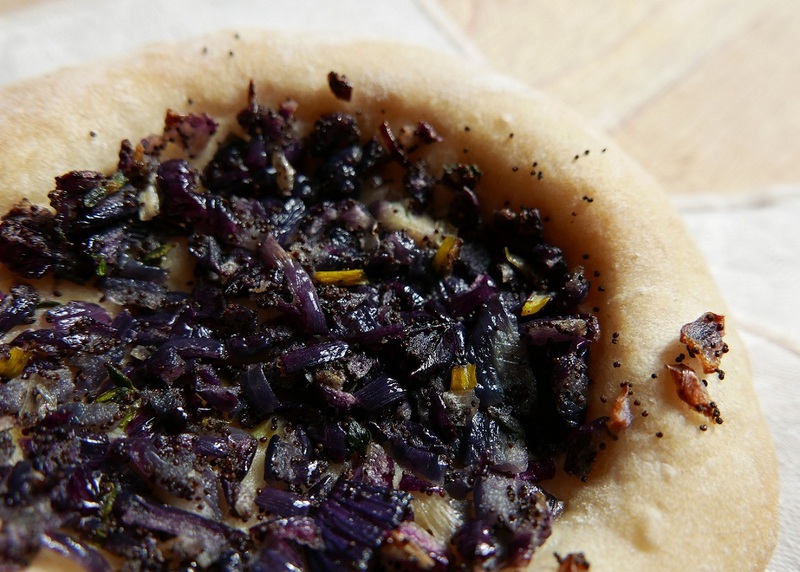 The recipe produces a good and genuine bialy, although purple onions are sharp and not cooked long enough to match most tastes. The recipe page is cited and linked in the Brookline (MA) Beacon for January 1, 2017–read and written in the New England community with the largest Jewish population.